You know the picture I’m talking about. You might have seen it in National Geographic. 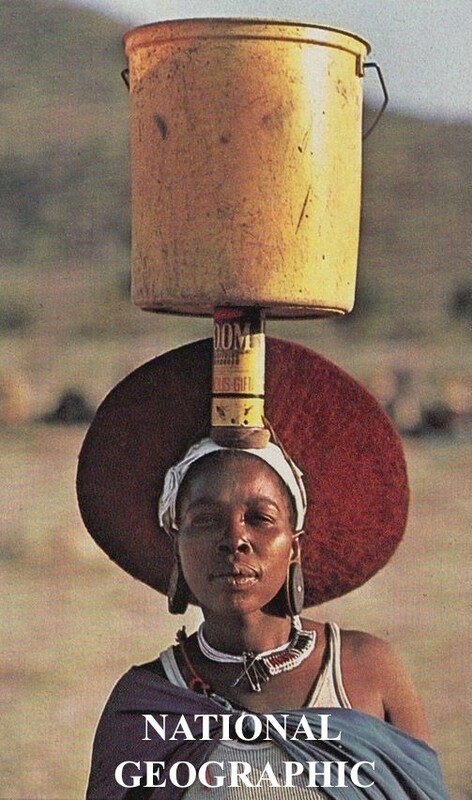 That one with the African woman serenely carrying a bucket of water on her head. Colourfully dressed; perfectly poised; walking off down a dusty path. It makes for a nice postcard. The reality of the situation, however, is far from picturesque. Neither you, nor I, can possibly imagine the layered hardships that fetching water creates for millions of African women. 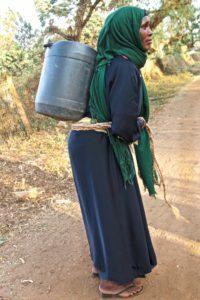 It’s estimated that women (and girls) fetch and carry 90% of water used for cooking, drinking, washing and cleaning in rural areas. It’s easy enough to carry an empty 20-litre plastic jerry, or even several, on the journey to a water point. The return trip is what she dreads. Remember the last time you took a large, full suitcase to the airport? Imagine if, instead of checking it in, they asked you to put it on your back and haul it around the terminal for a couple of hours? Or, imagine strapping a 6-year-old, or 40 tins of baked beans, to your back and hiking in the hills for a few miles. That’s what 44 pounds feels like. I tried to lift a full jerry can and could barely raise it above my ankles, let alone all the way up to my back! Forty-something Mama Ukona can, however. In fact, she stopped to chat with my friend and me while she was returning home from her second water run that day (see photo left). She said that she spends 6 hours a day on water duty, often arriving home well after dark. I couldn’t help but note that her back is bowed, and she wears flimsy flip-flops which offer no support. She doesn’t have a donkey to share her load, so she walks alone in the 100+ degree heat. What choice does she have? None. And the problem is getting worse all the time. The women I spoke with in Kenya’s sprawling northern Marsabit County where 90% of the population are pastoralists, told me that due to the catastrophic drought, they’re now walking further and visiting water points more often. They’re walking up to 5 miles each way, often setting out before sunrise. This increases the risk of physical or sexual assault, and bites from venomous snakes (including cobras and mambas). At a water point I visited high in the hills, spring water is accessed via an unprotected, deep and open well. 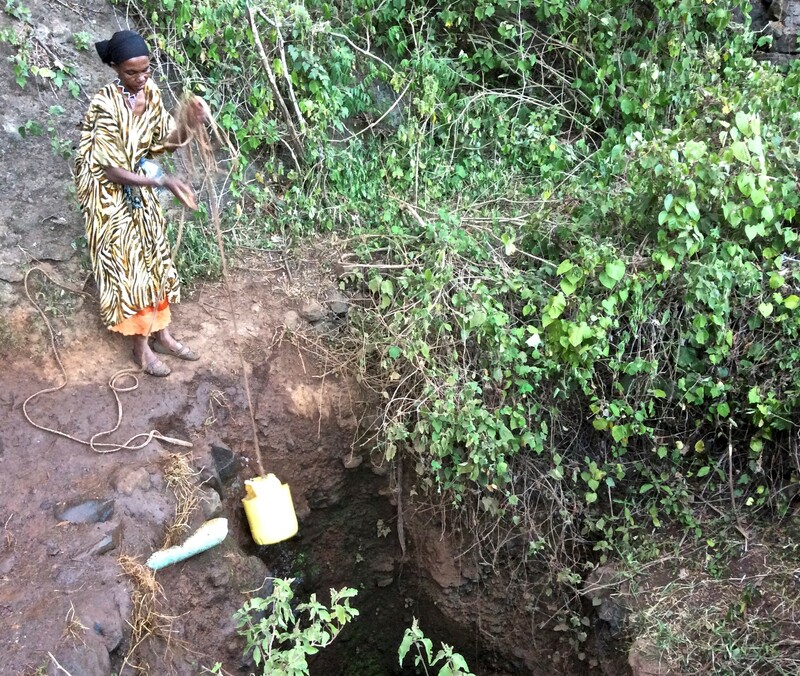 Domestic worker, Halima, a grandmother at 38, braces herself on the muddy edge, drops down a bucket on a rope, then pulls up the water. She does this 10 times to fill up her jerry can. Yet, if she falls in the well, there isn’t any way to climb out. She doesn’t know how to swim. Halima takes this daily task in her stride, asking, “What choice do I have?” None. And the problem is getting worse all the time. So let’s do the math — because water is life, but what kind of life? And what is that life worth? If a woman spends 4 hours a day fetching water, this adds ups to 60 days per year where she could have been earning an income instead. And when her children get sick from drinking poor quality water, she must spend her time nursing them. Again, an unpaid contribution. Never one that is remarked upon — and always one that takes her away from a possible income-earning livelihood. If you ask these women about the impact of water fetching on their bodies, they will all tell you: they ache. Their backs. Their arms. Their feet. Medical research points to permanent damage to women’s health directly attributed to carrying water. This includes spinal and pelvic deformities, feet and ankle problems, and spontaneous abortions. If she falls, she can break a leg, an arm — or even her neck. Worse still, when it comes to water, women have all the responsibility, and none of the authority. They might be responsible for collecting household water, but are rarely consulted or involved in the water planning and management. For households, and communities, this is a loss. A World Bank evaluation of 122 water projects found that the effectiveness of a project was six to seven times higher where women were involved, than where they were not. But rarely are they involved, especially in traditional cultures. 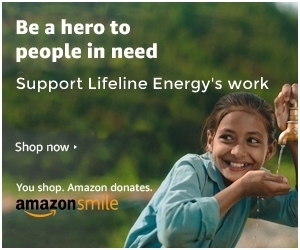 So what can Lifeline Energy do? It’s a problem we come face-to-face with when we’re in the field, and as a woman, as a human, it touches me deeply. We’re not a “water NGO”; we don’t work directly on water projects. But any big issue that impacts rural women, we care immensely about — because these are the women we serve. healthier based on the educational content that we deliver. For a woman trying to improve her life, and the lives of her children, every decision matters. And every decision brings her closer to improving the quality of her life and a step closer to earning a better living. 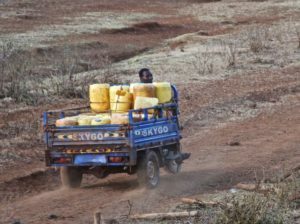 And while a bigger income doesn’t bring the water any closer — it will allow these women to pay someone with a vehicle (like these 3-wheeled mini-trucks) to transport the water for them. The means they have more time to devote to their families, a business and to themselves. In Kenya, we’re working with Horn of Africa Development Initiative (HODI) to bring the Lifeplayer to under-served women. In turn, HODI is helping to build resilient communities, which includes better water strategies for women.